Seated (left to right): Vice Chairman Thomas M. Hoenig, Chairman Martin J. Gruenberg, and Director Jeremiah O. Norton. Standing 1st Row (left to right): Suzannah L. Susser, Barbara A. Ryan, Arleas Upton Kea, Craig R. Jarvill, Doreen R. Eberley, and Arthur J. Murton. 2nd Row (left to right): Martin D. Henning, Cottrell L. Webster, Richard J. Osterman, Jr., Stephen A. Quick, and Andrew S. Gray. 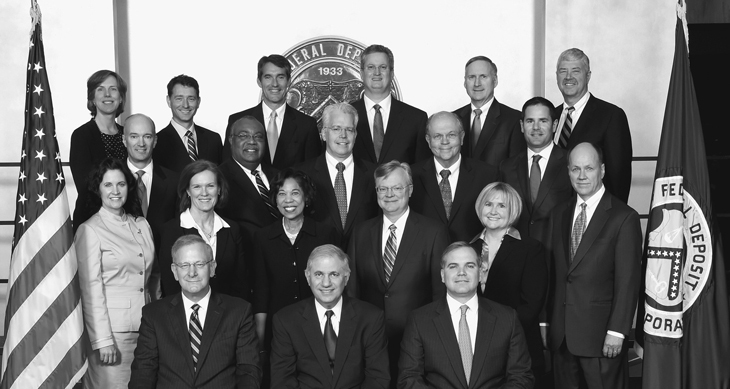 3rd Row (left to right): Diane Ellis, Mark E. Pearce, Bret D. Edwards, Russell G. Pittman, Eric J. Spitler, and Steven O. App. Not pictured: Barbara Hagenbaugh, Kymberly K. Copa, Segundo Pereira, Robert D. Harris, Fred W. Gibson, Barry C. West, Christopher J. Farrow, and C. Richard Miserendino.